In October, the publication "Swiss Compass – A Look at Our Political Future through the Credit Suisse Worry Barometer" discusses the topic of migration. In two texts, Flavia Kleiner and Luzi Stamm discuss the way in which immigration affects the Swiss economy and identity. Questions relating to migration have occupied an important place in the Credit Suisse Worry Barometer for years. In particular, concern about issues to do with foreigners has increased a lot since 2009. 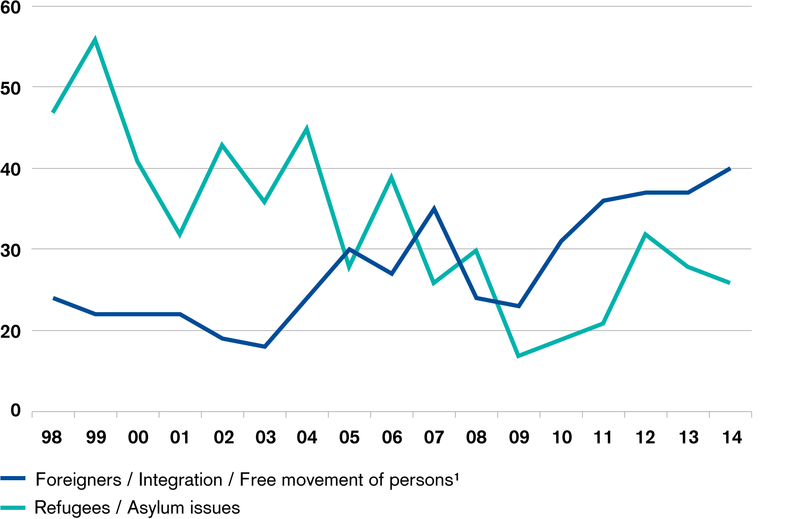 Refugee and asylum issues, on the other hand, have steadily declined in relevance when viewed over the longer term. When asked about the future relationship with the EU, a clear majority of respondents (66 percent) in 2014 supported a continuation of the bilateral path – despite the "yes" vote in the referendum on mass immigration. Joining the EEA was supported by only 41 percent, and termination of the bilateral agreements by just 31 percent of respondents. By comparison, however, joining the EU appears to have no chance: A mere 14 percent would want this. In the following guest articles (see box with link to PDF), Flavia Kleiner, co-chair of the liberal Operation Libero movement, and Luzi Stamm, vice-chair of the Swiss People's Party and the CINS and a Member of the National Council for the Canton of Aargau, give their views on this subject. They explore how the discrepancy between our economic and cultural openness and simultaneous fear of the foreign can be explained, and what food for thought this provides for politicians and economists. The Credit Suisse Worry Barometer has been published now for almost 40 years. During this time many of the worries have changed, whereas others have remained the same. This year's publication, "Swiss Compass – A Look at Our Political Future through the Credit Suisse Worry Barometer" is dedicated to these long-term top worries.